Each charger makes about a quart. 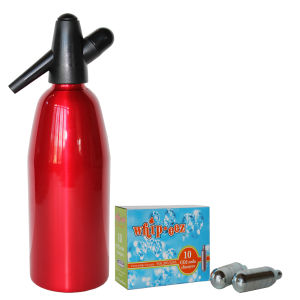 Whip-eez Brand soda Co2 cartridges are available for the North American coffee shop, restaurant, bar, ice cream shop, gourmet food market, or anyone who wants to make sparkling water in their home. Buy Co2 cartridges today! Chargers measure 2-9/16″ long and 11/16″ in diameter. Non-threaded. I get these for making homemade soda for my grandchildren. They love it!!! It is fun and easy. No problems and would recommend these to anyone. Bought these for the purpose of making homemade sodas. They worked great in my “other” brand siphon. I need to order more because I am experimenting with different ingredients for that ultimate drink. I really like the fact that I received my order lightening fast and since I bought parts and other items from this site that reached over $100, I did not have any shipping charges. I was a little scared the first time loading one of these cartridges on my siphon. But I learned real fast just how easy they are to use. You really can’t make a mistake. Just add cold water, tighten the head on your siphon and screw on 1 of these chargers. In my experience, waiting an hour or so afterwords will make your seltzer water “fizzier”. 100 of these will definitely last me through the holidays. I like to have my guests try different drink concoctions that I make. I get compliments all the time from the red or black glossy paint on the siphons, and no complaints from these CO2 chargers. I chose this USPS option because it was less expensive than the FedEx option. The chargers were packed well and they work great. These chargers work great. 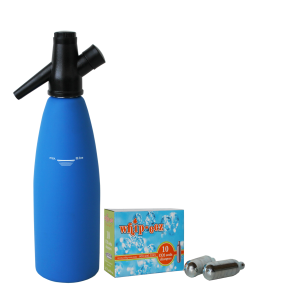 As a gift, I received a soda siphon, but I had a hard time finding these Co2 chargers at any stores. My daughter found this brand after searching online and I have no complaints. Very easy to use too. I just put it into the charger holder, screw it on until the top is pierced, and the cartridge “charges” the water in my siphon. That’s it. Simple, fast, and really cost effective. My next order will probably be a larger case. I Bought these chargers for my soda siphon. They work perfect. I love the fact that this brand Co2 is Pure Carbon Dioxide and does not contain any additives. 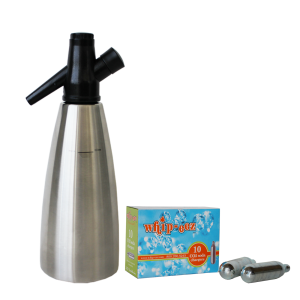 This 100 case is a good deal – especially for people like me who use their siphon all the time. I will buy here again. About once a year, I purchase these chargers to use with my soda siphon. I enjoy purchasing 100 at a time at a good price and not concern myself about it again. I suggest anyone considering these chargers to give them a try. They work marvelous, just like they are supposed to. In addition, whip-eez emails you a tracking number the same day you place your order. Now that is superb service. It makes great fizzy water. Sometimes I get in a hurry and don’t have the water as cold as it should be, but it still makes great fizzy water. The more colder the water, the more fizzier the water stays. Thinking about what makes these chargers so good is the fact, that after you make a bottle of seltzer, you really don’t “open” the bottle like store bought seltzer. You see, after you purchase a 1 liter bottle from the store and open it, the water goes flat in a few days. 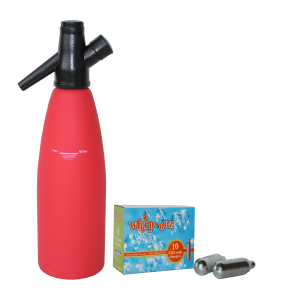 My siphon keeps the fizz, even after a week, I believe because you don’t “open” the siphon, you simply release the amount you want. These CO2 chargers work very well and are worth the money and time spent on making your own. Plus, by using these chargers, it is cheaper than buying club soda from the store, and you can have it on tap whenever you want. Stock up! I know I will. Already a frequent buyer and wanted to leave a review. Service is great, I get my order right away. I actually own a different make of siphon than whip-eez, and these chargers actually work better than others I have tried. My personal investigation on who makes the cleanest and best Co2 has the winner in Europe. They come from the country “Hungary” as each box has this printed on it. Keep up the GREAT work whip-eez! I’ll be seeing you soon. SMOKIN’ fast delivery!! Super gas. My parties are a hit with these. Thanks guys!